World 3- Airship is the Airship course of World 3 in Super Mario 3D Land. The level begins as a series of platforms, with a Spiked Pillar later on. There is a Bob-omb in this area. Donut Blocks divide the platforms leading away from the area with the Spiked Pillar. Afterward is another platform with a Spiked Pillar at the end of it, followed by two areas with crates and Spiked Ball launchers. Next is a large platform with a Checkpoint flag and a pair of Binoculars. The next area is filled with crates and two Bob-ombs. One of them contains a Fire Flower. By climbing the Donut Block staircase, Mario reaches another platform with a Spiked Pillar at the end. Another two Donut Blocks and a platform divide this area from the next, a large platform with several Spiked Pillars on one side; however, two safe spots have been designated. The rest of the platform before the pipe is made of Donut Blocks. The fight with Boom Boom takes place on two moving platforms, one going right and the other heading left. The flagpole will be on an airship that can be reached after Boom Boom is defeated. 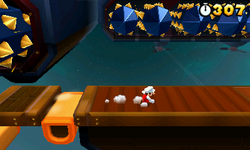 Star Medal 1: Right beside the first Spiked Pillar is a platform with the Star Medal hovering over it. Star Medal 2: Beneath the second safe spot on the platform with several Spiked Pillars is another platform. By heading right, the player can see a Donut Block with the Star Medal hovering over it. Star Medal 3: After defeating Boom Boom, the Star Medal will be at the very front of the airship.